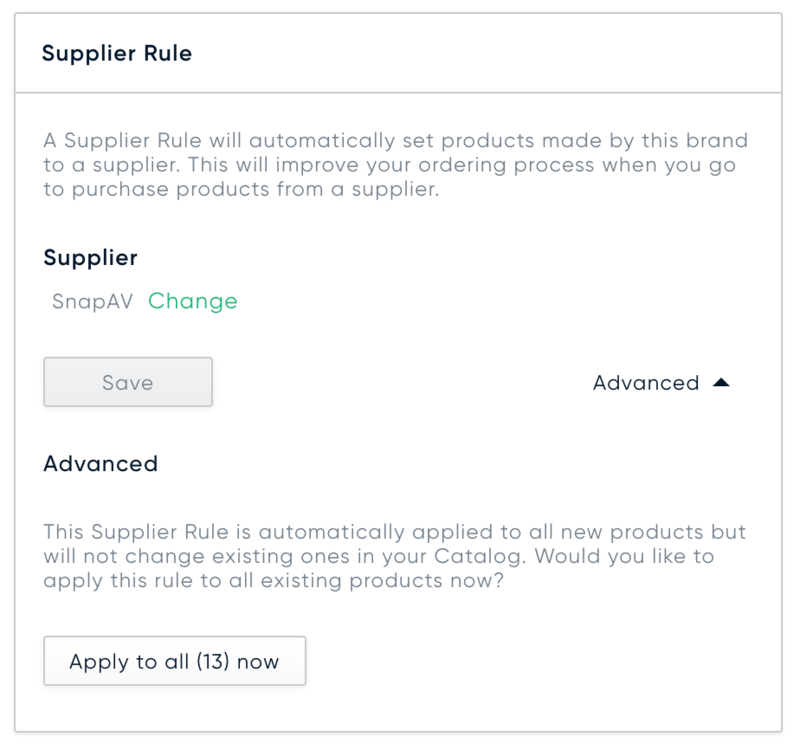 We introduced Supplier Rules as a way to help you set and maintain suppliers in your Settings and on associated products. This really becomes valuable when ordering and quickly building a purchase order. Otherwise you will be asked to add a supplier to every product trying to be ordered. What is a Supplier Rule? Similar to a Brand Price Rule, a Supplier Rule is a way to set the supplier on products based on the steps you define. A Supplier Rule has some of the following key capabilities. A Supplier Rule is applied automatically when a new Product is added to a Quote or your Catalog. A rule is set on each Brand individually and applied to all products assigned to that Brand only. You can manually apply a Supplier Rule to existing products. A Supplier set by a Rule can always be overwridden later. To get started with Supplier Rules you'll start by navigating to Settings and then to Brands. Next, click on an existing Brand to open its detail view. Select a Supplier on the right, and click Save. This will apply to all products under this brand going forward. However this will not apply to products that have already been added to the catalog. Be sure to click "Apply to all now button" to apply that supplier to all existing products in your catalog.